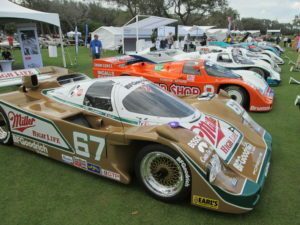 This year marked the 24th annual Amelia Island Concours which honored champion race car driver Jackie Ickx. The weekend started off Friday morning March 8th with the Porsche Club of America (PCA) Werks Reunion. This was the 3rd year for the event with 600 Porsches on display, with 150 of these entered in ‘judged’ categories. 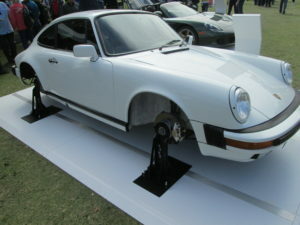 The event is very well organized with Porsche Classic support along with Pirelli Tire as a presenting sponsor. With over 135,000 dues paying PCA members in North America, this is one of their premier club events. With several auctions on the Island this weekend, I found the Gooding Auction to offer a wider variety of high end cars. There was a large Thursday afternoon crowd with ‘hammer’ prices for the most part falling slightly below estimate. 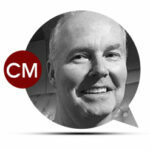 This may be a reflection of economic concerns or that prices are leveling. 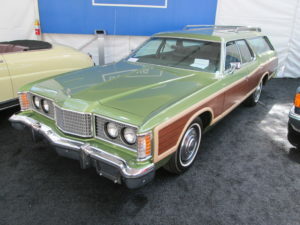 Of course at every auction there are surprises with a lime green 1974 Ford Country Squire station wagon selling for $45,900! With an estimate of $30,000 to $40,000, this vinyl wood sided wagon claimed 1,500 original miles and I suspect the reason it sold over estimate is someone felt compelled to own a part of their youth. A hot sunny Sunday began the Concours with one of the largest crowds in memory. What makes Amelia unique is they award two Best of Show trophies; one for the best touring car and one for the best race car. The year featured a special class of Ferraris 250 GT SWB (short wheel base), the Jaguar XK 120 and drag racers. 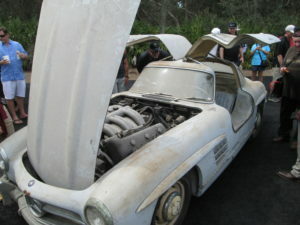 However, a car I found most attractive was an unrestored, all original 1954 Mercedes Benz 300 SL which had been in storage since 1965. This iconic ‘gull wing’ car was originally sold in LA and through a second sale to a naval aviator ended up in the Jacksonville, FL area. It was than purchased by a local resident and in 1965 put into storage with 35,000 miles. Purchased this winter by the Mercedes-Benz Classic Center it will begin a 3 to 4 year restoration at a cost of over $800,000. The goal is to restore the car to factory original specifications revitalize the existing parts and when necessary, use factory original parts. With each car invited to Amelia going through a very rigorous selection process, it has to be extremely difficult to judge this event. 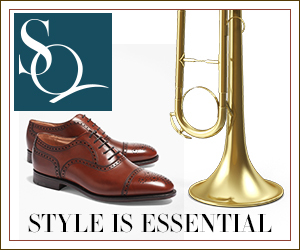 For some classes, the cars displayed are the finest known examples in the world. 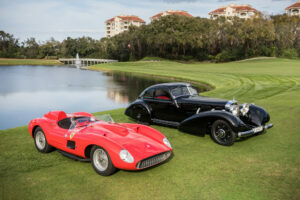 This year’s winners were a 1938 Mercedes-Benz 540K Autobahn-Kurier and a 1957 Ferrari 335S. 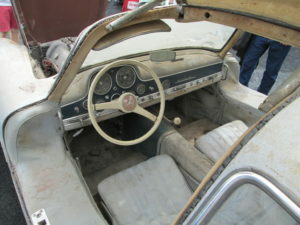 Original interior complete with 1965 dirt! The 1938 Mercedes is one of 419 built in this specification and according to factory literature ‘designed for incredibly high speeds on the Autobahn.’ The Ferrari 335 S was the most technologically advanced Ferrari in 1957. Powered by a 2 valve V-12, this engine was ignited by 24 spark plugs and produced 360 Horsepower. These cars were Outstanding Choices! This year’s weekend offered something for anyone remotely interested in cars. 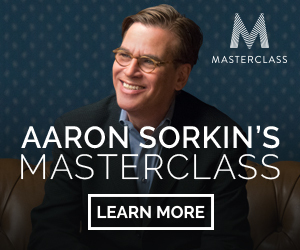 The design lines of the Jaguar XK120, the raw power of the drag racers and the history of early Ferraris are just a few things that made this event fun. 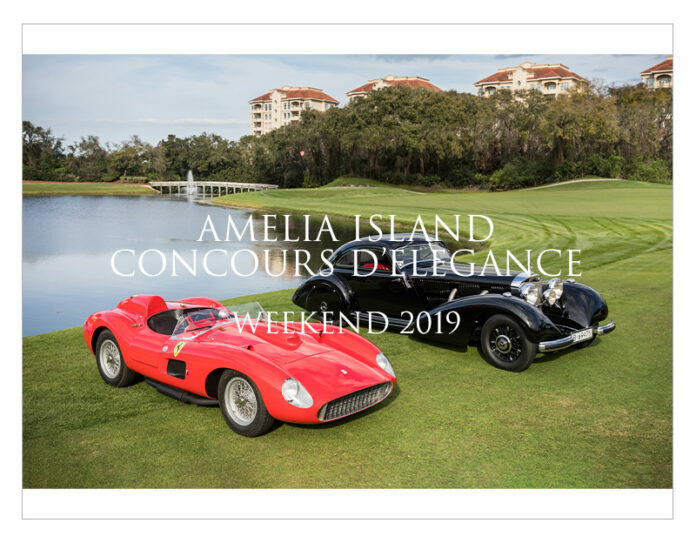 The Amelia Concours displays, celebrates and recognizes the cars of the past. It is also looked upon as the unofficial beginning of the car show ‘season.’ In my opinion there is no better way to wind down winter and ‘kick-off’ the season than the Amelia Island weekend! 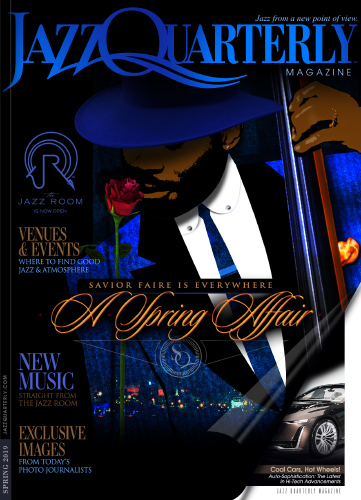 Previous articleNancy Kelly: Remembering Mark Murphy Featuring Randy Brecker & More!